Churning of the Ocean of Milk that is widely recognized as the best known and most influential of the Puranas, is sometimes referred to as the “Fifth Veda (it contains many stories known from the Vedic tradition ). The story appears in the Bhagavata Purana, the Mahabharata and the Vishnu Purana. Literal metamorphic meaning of manthan is deep contemplation, churning of facts, analysis aimed at solution or conclusion. Lord Indra, the King of Devatas, while riding on an elephant, came across a sage named Durvasa who offered him a special garland. Lord Indra accepted the garland, placing it on the trunk of the elephant as a test to prove that he was not an egoistic God. The elephant, knowing that Lord Indra had no control over his own ego, threw the garland to the ground. This enraged the sage as the garland was a dwelling of Sri (fortune) and was to be treated as prasada. Durvasa Muni cursed Lord Indra and all devas to be bereft of all strength, energy, and fortune. The churning of the Ocean of Milk or the Milky Way was an elaborate process. Mount Mandarachala was used as the churning rod, and Vasuki, the king of serpents, became the churning rope. The demons (asuras) demanded to hold the head of the snake, while the demigods (devas), taking advice from Vishnu, agreed to hold its tail. As a result the demons were poisoned by fumes emitted by Vasuki. Despite this, the demigods and demons pulled back and forth on the snake’s body alternately, causing the mountain to rotate, which in turn churned the ocean. However, once the mountain was placed on the ocean, it began to sink. Lord Vishnu in His second incarnation, in the form of a turtle Kurma, came to their rescue and supported the mountain on His back. The Samudra Manthan process released a number of things from the Milk Ocean. One product was the lethal poison known as Halahala. (In some versions of the story, this poison escaped from the mouth of the serpent king as the demons and gods churned.) This terrified the gods and demons because the poison was so powerful that it could contaminate the Milk Ocean and destroy all of creation. On the advice of Lord Vishnu, the gods approached the compassionate Lord Shiva for help and protection. Lord Shiva inhaled the poison in an act of self-sacrifice but Goddess Parvati rescued him. Some stories suggest that the all powerful goddess pressed his neck to stop the poison from spreading while other stories suggest that Goddess Parvati suckled him in the form of Goddess Tara to stop the poison form spreading. As a result, The color of Lord Shiva’s neck turned blue. For this reason, Lord Shiva is also called Nilakanta (the blue-throated one; “neela” = “blue”, “kantha” = “throat” in Sanskrit). When the heat from the poison finally became unbearable for Lord Shiva, he used his trishul to dig for water, thus forming the Gosaikunda lake. The story begins with Indra, the king of gods, riding his elephant. He came upon a sage named Durvasa. The sage decided to honour Indra by giving him a scented garland. Indra took the garland, but placed it on the forehead of his elephant. The elephant was irritated by the scent and threw the garland off, trampling on it. The angry sage cursed Indra and the Adityas(gods) to lose all their wealth; and be deprived of Laxmi, the goddess of wealth and prosperity. Indra was thus immediately dispossessed of all his wealth and treasures. Indra then approached Brahma, the creator, to help him regain his treasures who suggested him to churn the Ocean of Milk in order to regain his treasures and obtain the Nectar of Immortality. However, such a stupendous task could not be performed by the Adityas (gods) alone, so they sought the help of their enemies, the Asuras, with the understanding that the Asuras would be allowed to partake a portion of the Amrutha (divine nectar of immortality). The ocean was churned by using the Mount Mandara as the pole and the King of Snakes, Vasuki, as the rope. The gods held the tail of the snake while the demons (Asuras) held the head end of the snake and they pulled on it alternately causing the mountain to rotate which in turn churned the ocean. However, once the mountain was placed on the ocean, it began to sink. Then came Vishnu in his second incarnation, in the form of a turtle Kurma, and supported the mountain on his shell back. Finally, Dhanvantari, the Heavenly Physician, emerged with a pot containing amrita, the heavenly nectar of immortality. As the Asuras rushed to take the nectar, the frightened Adityas appealed to Vishnu, who then took the form of Mohini. As a beautiful and enchanting damsel, Mohini distracted the Asuras, took the amrita, and distributed it amongst the Adityas who drank it. One Asura, Rahu, disguised himself as an Aditya, and drank some Nectar. Due to their luminous nature the Sun God Surya and the Moon God Chandra noticed the switching of sides. They informed Mohini. But before the Nectar could pass his throat, Mohini cut off his head with Her divine discus, the Sudarshana Chakra. The head, due to its contact with the amrita, remained immortal. To gain revenge on Sun and Moon for exposing this – It is believed that this immortal head occasionally swallows the sun or the moon, causing eclipses. Then, the sun or moon passes through the opening at the neck, ending the eclipse. The story ends with the rejuvenated Adityas defeating the Asuras. “A bas-relief (above) at the temple of Angkor Wat in Cambodia, includes a depiction of devas and asuras working together to stir up the Ocean of Milk in an attempt to free the precious objects lost within, including the elixir of immortality called Amrita. The scheme, masterminded by Vishnu, was to wrap the serpent Vasuki around Mount Mandara, and then to rotate the mountain and to churn the surrounding sea (in the manner of a gigantic food processor), by alternately pulling on the serpent’s head and then on his tail. Encoded into this most venerable esoteric myth are many symbols explaining the true story of the actual use and processing of Amrita, as it was done throughout many parts of the world. The research conducted by Spagyric Arts, LLC., has proven conclusively, that this was a story based in a real history of ancient transoceanic crossings between the Old and New World. It was also recording the story of the ancient Magi, and their on-going mission; to educate the people of the world; to teach them the principles of the cosmo-religion. From the period roughly beginning in 3114 BCE, and extending into the current era, the Magi’s focus (or Magu in India) appears to have been the north American continent. There are many versions of the story of the Churning of the Ocean of Milk. In all of them certain key elements are shared in common. The most important to our investigations is the connection to the production of the ‘Elixir of Immortality’ known as Amrit, or Amrita (also known as Soma, Haoma, the Elixir of Life, etc.) from sedimentary mineral deposits of dolomite laid down by the world’s first photosynthesizing organisms, blue-green algae’ (technically, cyanobacteria). The story of the churning also encodes real history, including a record of the comet disaster which occurred in 4200 BCE, and also again in 3114 BCE. This first event — which caused the antediluvian flood — was a global paroxysm. Following this event mankind — those who survived — were afraid of venturing out on the ocean again. There appears to have been a great effort expended on behalf of the esoteric members of the cosmo-religion, to reactivate the earlier work of global education. However, another comet disaster rocked the world once more in 3114 BCE. (excerpted from the Vietnam, Cambodia and Laos Handbook by Moon Publications). Every culture has its legends of the origin of the species. 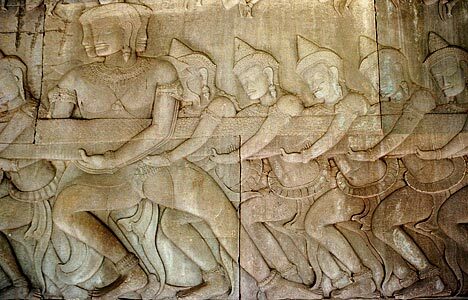 The Hindu creation myth Churning the Sea of Milk is shown in the bas-relief panel at the East gallery (panel 4) of Angkor Wat. 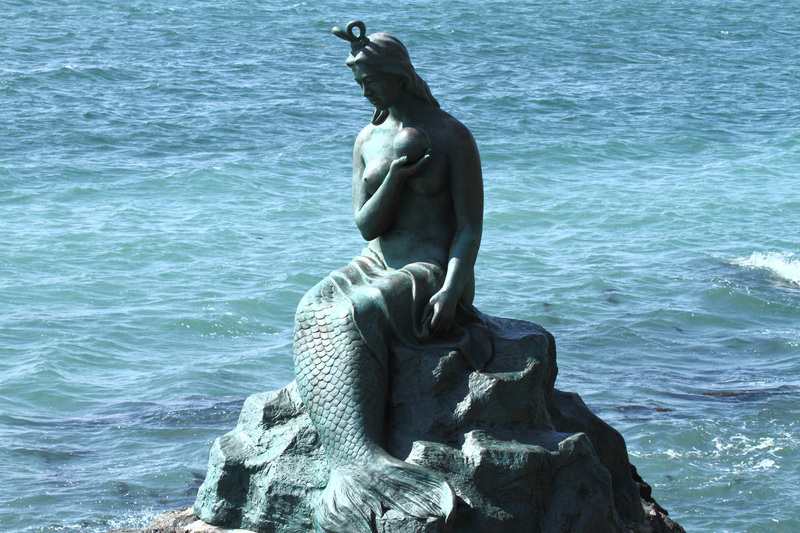 In Hindu mythology, 13 precious things including the elixir of immortality were lost in the churning of the cosmic sea. Finding them again required a joint dredging operation between gods and demons. Assisting in this endeavor was the giant serpent Vasuki, who offered himself as a rope to enable twirling of a “churning stick.” The serpent was yanked back and forth in a giant tug-of-war that lasted for a thousand years. In the bas-relief panel, the front end of the serpent is being pulled by 91 surly-looking asuras (demons), anchored by the 21-headed demon king Ravana; on the right are 88 almond-eyed devas (gods) pulling on the tail, anchored by monkey-god Hanuman. The central pivot, or churning stick, is a complicated piece of imagery. Vasuki has wrapped himself around Mount Mandara, represented by a tower. At one point Mount Mandara started to sink, and had to be propped up by a giant tortoise, an incarnation of Vishnu. The Sea of Milk, or the Ocean of Immortality, is represented by innumerable fish and aquatic creatures, torn to shreds as they swim close to powerful air currents near the churning stick. Directing operations at the center is the large four-armed figure of Vishnu, closely associated with Angkor Wat’s builder, Suryavarman II. The smaller figure above Vishnu is Indra, god of the sky. The actions of the gods and demons cause Vasuki to rotate the tower-mountain and churn the sea into foam, like a giant cosmic blender. This releases a seminal fluid that creates a divine ambrosia, amrita, the essence of life and immortality. Many other treasures are also flung up. Born of this action are apsaras, or celestial dancers, a purely Khmer innovation. The seductive apsaras promise a joyful existence for those who attain the ultimate incarnation; it is assumed that higher incarnations will be male in form. According to Angkorologist Eleanor Mannikka, who has been studying the place for over 20 years, the bas-relief has a practical function in marking the number of days between the winter and summer solstices. Mannikka maintains that the 91 asuras mark the 91 days between the winter solstice and spring equinox in March, while the 88 devas represent the 88 days to the summer solstice after the equinox period. Mannikka says this is just one of the hidden cosmological meanings coded at Angkor Wat, and that the temple is remarkably attuned to the movement of the sun and moon. Michael Buckley is author of the newly-published Heartlands. He has also written the Tibet Travel Adventure Guide, Moon’s Vietnam, Cambodia, and Laos Travel Handbook, Cycling to Xian , Tibet, and has guided VeloAsia tours in Sumatra and Vietnam. The ideas in the Samudra manthan and Angkor Wat versions display sophisticated cosmological and astrological interpretations, that evolved following a merging of the Cosmic Axis Mundi World Tree and the Ambrosia-Soma drink of immortality motif. “The apex of an Egyptian pyramid serves as the axis of this world mountain, just as the peak of a Buddhist stupa bears a mast that makes the axis mundi explicit and obvious. So does the well that descends 120 feet beneath the central tower of Angkor Wat and the apocryphal story that the round structure at the center of Sacsahuaman is a tower that reaches as far into the earth as it does into the sky. A pilgrim following the first rectangular gallery at Angkor Wat is told a story in relief sculpture that directly associates that monument with the center of the world. The sculpture’s most extraordinary scene depicts the great serpent Vasuki wrapped, like a python on a pole around the axis of the mountain of the world, atop which sits the dreaming god Vishnu. The gods wish to release the elixir of life from the cosmic seas and to do this they pull the immense snake one way, while the demons pull it the other. The seesawing serpent stirs the ocean and releases the elixir, an action that gives the sculpture and the story its name: The Churning of the Sea of Milk. 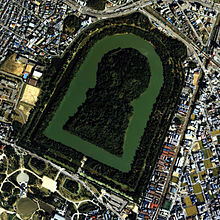 The monumental Kofun tumuli mounds that are all over Japan, especially the key-hole shaped ones surrounded by massive moats, hold all of the above mentioned elements and fit the same cosmological mold of pyramidal building. So far no satisfactory theory has yet come about for why the distinctive and mysterious key-hole shape was chosen for the multitudes of kingly and chiefly tumuli beginning in the 3rd c. in Japan (and a few in the ancient Gaya kingdom of Korea), but in this article, we propose here two possible reasons why the keyhole shape was chosen for Kofun tumuli. The first, is that the shape resembles an early Sarmatian bronze mirror with a handle. The mirror is a solar status and magical and legitimacy symbol for ancient Japan’s ruling regimes and the Amaterasu goddess, as well as for other ancient civilizations such as the Celts. As a burial item, it was likely included as a device to keep the soul close to the body or to trap it (cf. Frazier’s ‘Golden Bough’). Many Kofun period burials hold grave goods that are similar to those of elite kurgan burials of the Sauromartians/Sarmatians (eg Pavrovka site) and also Saka burials (at the Issyk site). Another possibility is that the keyhole shape is a Mother Goddess symbol, the keyhole symbol is identical to the Phoenician symbol for the goddess Tanit (who is also identified with the mother goddess Asherah) and to some extent, the Ankh symbol held by the Egyptian goddess Isis as well — both of which stand for regeneration and life-giving forces (see Isis & the Ankh). 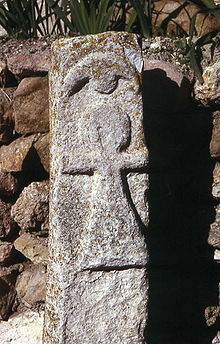 Tanit, has been suggested, is the Egyptian deity and derived from Neith, a Syrian-reptilian deity and goddess of water and fertility, and possibly also associated with the Bantu deity which is supported as the Bantu people also have a similar ankh-shaped fertility doll amulet. In the legend of Izanagi and Izanami, though existing as a much more truncated and streamlined and less embellished version of the Churning of the Ocean of Milk… the key elements are there. 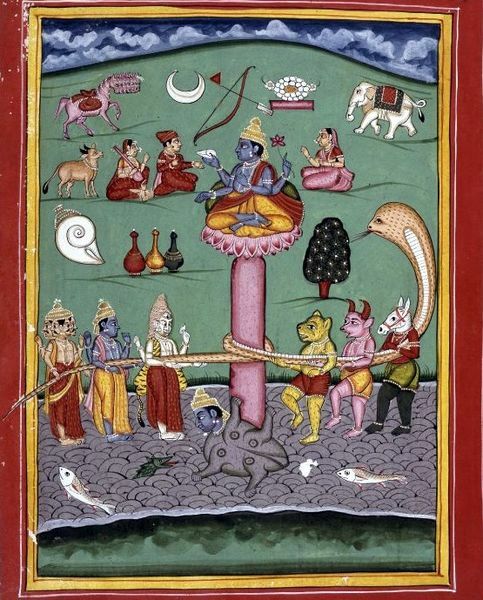 The cosmic couple churn the briny ocean (with a phallic spear), they dance around a Cosmic Pillar, an allusion to Mt Meru or Mt Mandara found in the Hindu-Purana and Khmer Angkor Wat versions. The immortality motif is also evident in the Izanagi and Izanami myth apart from the churning of the ocean, in the power of the peaches that are thrown at the demon-asuras to hold death at bay as Izanagi escapes the demons of the Underworld. In China, peaches are a part of Taoist the demon-repelling arsenal. The huge Kofun “pyramidal” tombs are visual metaphors of the Underworld’s Cosmic Mountain (Pillar) surrounded by an Ocean of Milk. In the myth, as Izanagi emerges from Underworld, he has to purify himself by washing in the river, the Indo-Iranian-style water purification ritual practice is similar to the harae rituals that have developed since those ancient times, and that are a central element of Japanese shrine and Shintoism practices today. 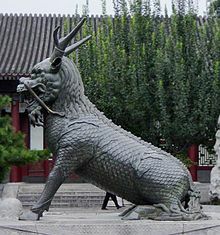 In the art iconography of the Asuka (through Nara) period, the devas, asuras, apsaras, Mt Meru, fountains and water-springs of life, and cosmic turtle are to be found everywhere, except that they are in the form of stone statuary or wooden or bronze sculptures. The hero Bulūqiyā becomes king of the Sons of Israel at the death of his father, and finds in the palace a gold box in an ebony casket on a white marble column containing parchment written in Greek. The text gives instructions how to obtain the magic ring of Solomon which bestows power over all living things, and immortality. His advisers recommend him to set out with the wise man ˁAffan. Here the text offers close comparison with the Akkadian version: “Followed by the learned ˁAffan, he (Bulūqiyā) left the city and journeyed into the desert. Only when they had gone some way did Affan say to him: “Here is the propitious place for those conjurations which will show us our way”. They halted; ˁAffan drew a magic circle about him in the sand, and, after performing certain rituals, brought to light the spot which was the entrance, on that side, to my subterranean kingdom.” (cf. Gilgameš Epic, tablet 4) The two men travel through the desert to the subterranean kingdom of Queen Yamlika, who gives them magic juice from a plant. This enables them to walk across the seven seas to Solomon’s tomb. They reject her advice to give up their plan and to be content with another plant which gives eternal youth to those who eat it. After marvellous journeys across the Seven Seas, Bulūqiyā and ˁAffan arrive at the Isle of the Seven Seas with apple trees which are guarded by an enormous giant who does not allow them to eat the fruit. On the island they find the tomb of Solomon in a cave and find the corpse wearing the ring in great splendour. Their courage nearly fails, but then ˁAffan plucks up courage and approaches the body, leaving Bulūqiyā to pronounce conjurations. But Bulūqiyā in the moment of stress says the words backwards, whereupon a drop of liquid diamond falls upon ˁAffan and reduces him and the precious plant juice to a handful of dust. Bulūqiyā runs out of the cave and wanders around alone and despairing. An army of demonic creatures gallops aggressively up and spirits him off over a fabulous distance to the kingdom of King Sakhr, king of the demon world, which lies behind the cosmic mountain Qaf. Sakhr entertains him with a feast, and then tells him the story of the world’s origins. For the first time the narrative becomes Islamic: Allah created the world for the coming of Muhammad the Prophet and for the punishment of infidels. Sakhr himself will never grow old and die, for he has drunk from the Fountain of Life which is guarded by the sage al-Khiḍr. When Sakhr has finished explaining, he has Bulūqiyā spirited straight back to his own kingdom. While these Indian and Arabic stories of the subterranean Underworld and immortality elixirs help us understand the funerary and immortality beliefs and worldview of Eurasia, the immortality fruits of the West, South and North Asia are apples and pomegranates, and do not fit the Japanese Izanami and Izanagi legend which focuses on peaches as the demon- and death-repelling fruit, so we must look for an alternate source of the myth to be found — somewhere where peaches were domesticated in those times. The demon-peach immortality motif and Izanagi’s journey to the Underworld to look for Izanami — suggest that the Japanese version is an intermediate or evolved version between the Puranic-Khmer version of the Churning of the Ocean of Milk, with the ideas of an Underworld Queen (Izanami) and demons as guardians of immortality and where peaches are the ultimate charm or amulet against death.